Shopping for gifts can be hard. That’s why Big Poppa Smokers offers the gift of gift certificates. Big Poppa Smokers gift certificates are perfect gifts for BBQ lovers, even if they haven’t started barbecuing, this gift may help push them towards the life of a BBQ addict. 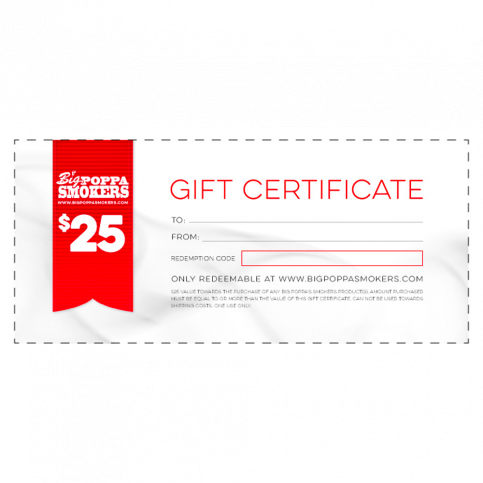 Share your love of Big Poppa Smokers with a friend by gifting them a BPS Gift Certificate. An easy solution to last minute gift shopping. Forgot your aniversery? friend's birthday? No need to worry BPS Gift certificates are great for last minute gifts and hassle-free. Please note: Gift Certificate orders are processed and emailed during normal business hours. Make someone's day by giving them a BPS Gift certificate. The fastest and easiest give idea. Please note: Gift Certificate orders are processed and emailed during normal business hours. Help a friend get into the world of BBQ with a BPS Gift Certificate perfect for any occasion. Please note: Gift Certificate orders are processed and emailed during normal business hours. A BPS Gift Certificate is the fastest and easiest way to show someone you care. Please note: Gift Certificate orders are processed and emailed during normal business hours. Great for last minute gifts and it gives your loved one the choice to shop at their taste. Please note: Gift Certificate orders are processed and emailed during normal business hours. Nothing’s Better Than The Gift Of Barbecue. Avoid the trips to the stores, the struggle of finding parking and the ache of not being able to find the perfect gift with Big Poppa Smokers BBQ Gift Certificates. Big Poppa Smokers BBQ Gift Certificates are the perfect gifts for any occasion - birthdays, anniversaries, graduations, celebrations, or just a nice gesture. These gift certificates are an excellent gift for BBQ lovers or for someone who’s looking into getting into the world of barbecue. Give someone the gift of choosing their gift with this BBQ gift certificate. Big Poppa Smokers Gift certificates are perfect last minute gifts, they are sent to you the same business day you submit your order (only sent during regular business hours) in a PDF attachment with a unique code, you can easily print the gift certificate at home or send it to someone via email. Big poppa Smokers BBQ Gift Certificates are good to use towards any product in Big Poppa Smokers online BBQ store - rubs, sauces, BBQ accessories, grills and smokers. There’s tons of products to choose from so there’s no going wrong with a BBQ gift certificate. 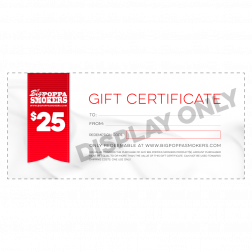 Make gift giving hassle-free and easy with the help of Big Poppa Smokers Gift Certificates. Big Poppa Smokers Gift Certificates are the fast and easy solution to giving the perfect BBQ gift. They're great for all occasions - birthdays, holidays, anniversaries, graduations, etc. There's no going wrong with gifting a BPS certificate to any BBQ lover. BPS Gift Certificates make a great last minute gifts, they're sent to you through a PDF file via email within 24 business hours after placing your online order. You can then simply print it out at home or forward the email to whom you're gifting this gift certificate to - it's that easy! Choose from a variety of amounts from $10 - $100. Make gift giving fast and easy with the help of Big Poppa Smoker BPS Gift Certificates. of amounts from $10 - $100. You can't go wrong with a BPS Gift certificate.